Your best local resource for everything Apple. From iPhones, iPads, Watch, Computers, iPods, iOS, Mac OS X, WatchOS – we support, train and are dedicated to helping people get the most out of their Apple products. Our group is for the beginner to the expert and everyone in between. We are an educational and not-for-profit organization supporting Tuscarawas County since 2002! We held a very informative meeting and covered OS X Tips & Tricks on dealing with special characters, hard drive cleanup and spotlight search features. Marilyn gave a fantastic presentation on Keynote for Mac, for the iPad and then Keynote Remote app using the iPad and the iPhone. We also saw a few iOS apps that were very well received, Photofunia and Vinylize Me. Who said you can’t have a meeting without some great food to munch on. 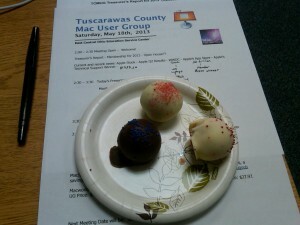 We had some Creative Cake Bites to enjoy for our meeting today. We are having our monthly meeting on Saturday, May 18th from 2:00pm to 4:00pm. We will be covering Apple’s own Keynote software for the computer, the iPad and remote. We will also have another session on Mac Tips and Tricks, favorite and informative web sites and much more. Look forward to seeing you at this meeting. Use discount code PCBW and get 50% off most ebooks/videos and 40% off most print books from O'Reilly Media.